Snack time at our Co-op is always the hardest! I need something healthy that will get the kids through to their next class without filling them so full that they can't eat lunch! I love the Horizon Good & Go Snacks for that reason. Riley who is a big boy at 10 years old definitely needs a good filling snack, but I find when he eats too many carbs or sweets he isn't hungry at lunch. So I am super happy that these snacks have just the right blend of protein and carbs. 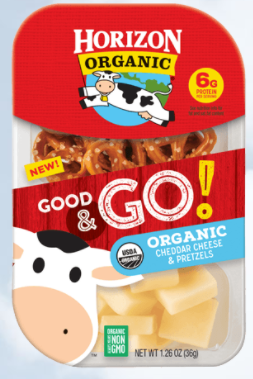 Horizon Organic®, a leading national organic dairy brand, recently announced the launch of a new line of snacking products. Horizon Organic Good & Go! Snacks are great to peel open before sports practice and a convenient staple for school lunches. With 5 or more grams of protein per pack, it's a deliciously easy way to keep kids going. Available in three irresistible combinations kids love, these products offer new feel-good snacking options for all families. The kids all loved them, the favorite was the Colby & Apple Crisps. I will definitely be making sure I have these on hand all year.